I’ve been wanting to try this for a while, adding baby food veggies to boxed mac-n-cheese. It’s a technique I’ve borrowed from the Sneaky Chef Cookbooks. I hadn’t tried it up to now because I only had the garden baby food veggies on hand, the ones whose primary ingredient is peas. I finally bought the standard mixed veggies that are predominantly made up of carrots. They’re 5 calories more than the garden veggies, but they mix in beautifully with the dayglo orange sauce that comes in the box. The flavor blends right in, toning down the artificial taste of the powder packet while adding body to the sauce. Yumolicious! 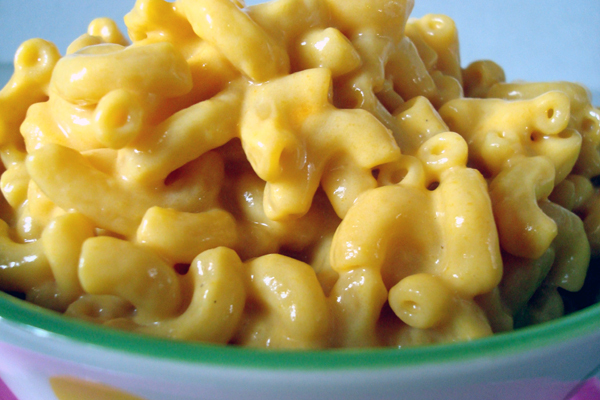 Prepare macaroni and cheese according to package instructions, substituting Unsweetened Vanilla Almond Milk and Smart Balance Light margarine for the milk and butter called for. Mix in baby food, stirring thoroughly until blended. Makes 3 1-cup servings. Approximately 300 calories per serving. Entry filed under: recipes, tips & techniques. Tags: healthier comfort food.